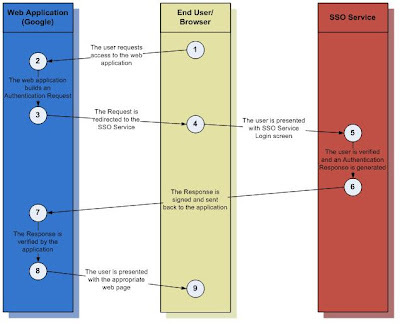 This is the second in a series of articles discussing the implementation of an SSO application for Google Apps. The first .NET Google SSO Part 1 of 2 began the discussion by laying out the steps needed to handle the initial Authentication Request made by Google. This final piece will complete the package by illustrating the generation of the Authentication Response. Google will expect the Authentication Response to come back as a form posted to the AssertionConsumerServiceURL provided by Google in the inital request. The form needs to have at least two elements on it, a <textarea> named SAMLResponse and an <input> named RelayState. The RelayState element is the url to redirect the user to at Google once the response has been sent. This is usually the same as the RelayState that Google provided to you via the RelayState url parameter. <samlp:Response ID="RESPONSE_ID" IssueInstant="ISSUE_INSTANT" Version="2.0" xmlns="urn:oasis:names:tc:SAML:2.0:assertion"
If we continue with the project created using the first blog post, we currently have one item on our form, a label called lblError. You will need to add two text boxes, txtUser and txtPwd to allow the user to enter their credentials and a button, btnSubmit. Format the form to your liking, and then add some code to authenticate the user, this can be done against a directory, a database, etc. This example will authenticate a user against ADAM. googleUserName = googleUserName.IndexOf("@") > 0 ? Now that our user is authenticated and we have their Google UserName, the next step is to generate an xmlDocument object using the AuthnResponse template. The template that we need is similar to the AuthnResponse shown above, with one very important difference; we don't want the <Signature> element or its children. We will be adding this using the signedXml object later. Create an xml file named AuthnResponseTemplate in your project directory. Copy in the AuthnResponse xml below and save the document. // Sign the XML document. // Create a SignedXml object. // Add the key to the SignedXml document. // Create a reference to be signed. // Add an enveloped transformation to the reference. // Add the reference to the SignedXml object. // it to an XmlElement object. // Append the element to the XML document. That should do it! The user will then be allowed into their Google account.